Malta is a small independent nation consisting of three islands, Malta, Gozo, and Comino located in the center of the Mediterranean Sea. Malta lies just 93 km (58 miles) south of Sicily Southern Europe and roughly 300 km (186 miles) north from the African coast. The capital city of Valetta, also known as just Malta, is centrally located on the island's north coast and has the largest harbor. The port of Malta has a very pleasant climate with an average high temperature of 23C (73F) during the day and 16C (61F) at night. The average annual sea temperature is 20C (68F), which is the highest in Europe. The coldest month is January while the warmest is August. Round-trip route with on/off privileges in Valletta! Easy to use system map of the Malta Island! Over 30 stops and 50 points of interest along 2 routes! Hop on the double-decker sightseeing bus and hop off at any one of the stops. Customize your sightseeing! See the highlights and sights of Malta you are interested in. Round trip transportation from your Valletta Malta Cruise pier! English, French, German and Italian speaking certified guide! Stop at Blue Grotto and Marsaxlokk village! Free time at Marsaxlokk market! Admire one of the most beautiful natural wonders of Malta, the Blue Grotto. These caves combine with the sunlight and the surrounding chain of caves to reflect tons of blues. Afterward, you will have free time to do some shopping at the popular Sunday market at Marsaxlokk. Round trip Valletta Malta Sightseeing in a Vintage Bus! Comfortable open-air shore excursion buses! English live guide narration during the route! 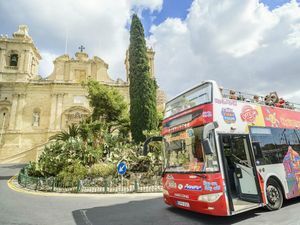 City sightseeing of Vittoriosa, Cospicua, and Senglea! Escape the cruise ship shore excursion crowds and enjoy unique sights of Valletta and surrounding area! 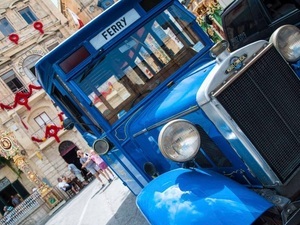 Get to know the Three Cities of Malta in a unique way, on board a vintage open-air bus! Admire the architecture of Vittoriosa, Cospicua, and Senglea, bring your camera, there would be several photo stops. Round trip transportation from your Valletta Cruise pier! Sightseeing in Cospicua, Vittoriosa, and Senglea! Guided walk in Marsovin Cellars in Marsa! Wine sampling and local savories! Enjoy your day while you discover the magic of the Three Cities - Copspicua, Vittoriosa, and Senglea. Then you will visit the Marsovin Cellars for some wine tasting. Have fun! 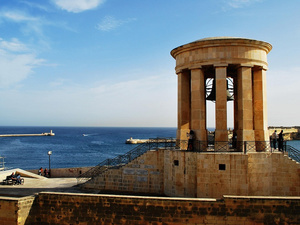 Guided walk through Valletta Center and Barracca Gardens! Entrance ticket to St. John's Co-Cathedral! Ticket for Malta Experience Show! 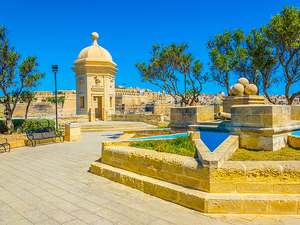 Walk through the old streets of Valletta and visit the beautiful Barracca Gardens. 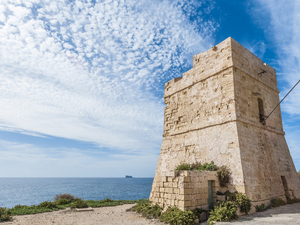 Then you will enjoy the Malta Experience Show where you will learn the vast history this country has. This Valletta Excursion is a must!